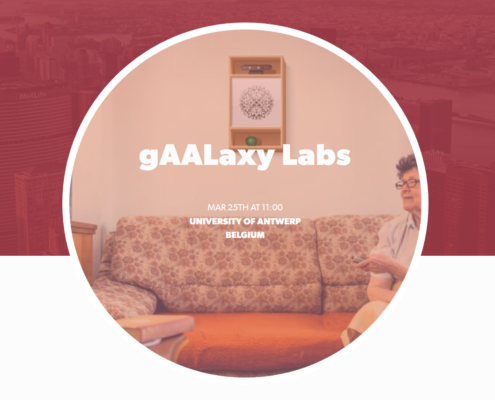 The gAALaxy project team kindly invites you to join us at the gAALaxy Labs Event on the 25th of March at the University of Antwerp. Networking Event for Smart AAL Home Solution Providers who are looking for certified AAL Bundles. Networking Event for End-User Organisations who are looking for independent AAL Bundles. gAALaxy is an international research and development project. The aim is to merge stand-alone solutions that support older adults in their core areas of life. The holistic approach combines home automation systems with AAL products on a gAALaxy middleware. Fall sensors and a mobile safety watch grant fast and reliable help. In addition, intelligent light and device control increases the well-being at home. Increase your freedom and independence. Thanks to the mobile safety watch you can be mobile and still feel safe. Help is just one click away! Your relatives can be informed as soon as something is wrong. They can be at ease because they know you are ok.
gAALaxy Labs Event on 25th of March in Antwerp! https://www.gaalaxy.eu/wp-content/uploads/2019/03/News_Bild_gAALaxy_Labs.png 854 1278 Judith Kathrein https://gaalaxy.eu/wp-content/uploads/2017/10/gAALaxy-Logo_schwarzweiß-300x80.png Judith Kathrein2019-02-18 15:28:052019-03-18 15:31:42gAALaxy Labs Event on 25th of March in Antwerp! The fearless system identifies falls with the help of a 3D infrared sensor and activates an emergency chain. A mobile safety watch for indoor and outdoor use. It integrates an emergeny alerting system, localization in emergency situations and an automized call function to provide fast help. Sensors that regulate lighting and identify movements, smoke detectors and smart light switches can be adapted to the individual needs and increase security and comfort at home. A piece of furniture to enable an ambient integration of the system in the living environment. Learn more about the solutions and how they interoperate by clicking on the button below. The gAALaxy solution bundle is tested in three pilot regions in Europe with persons over 60 who are living in their private homes. The Austrian Red Cross – Freiwillige Rettung Innsbruck leads the pilot region North Tyrol in Austria. 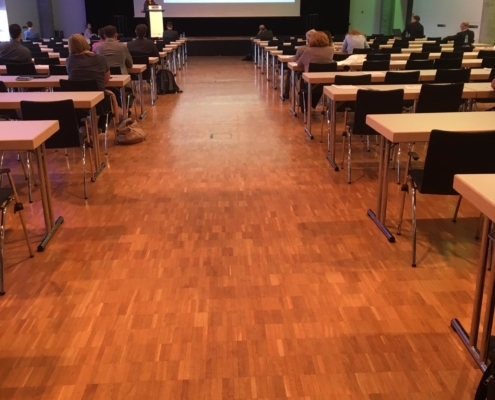 70 older adults in the city of Innsbruck and surrounding areas test the gAALaxy bundle in their own homes. The test region flanders is led by SF1 and Fifthplay. 60 older adults are testing the gAALaxy solution bundle in the surroundings of Antwerp and Ghent. 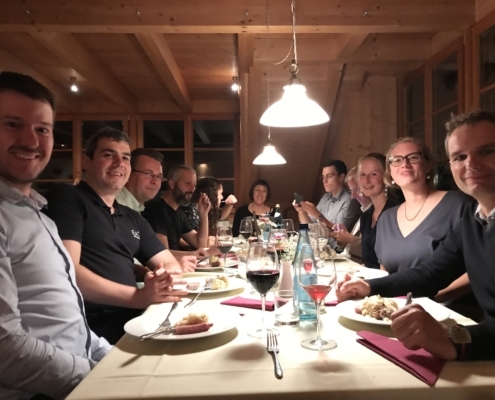 Eurac research together with rehab clinic Villa Melitta leads the pilot region South Tyrol in Italy. 20 older adults, living in the city of Bolzano and surrounding areas, test the gAALaxy solution bundle there. If you want to be part of the gAALaxy family and test the gAALaxy bundle for free, click on the button below. 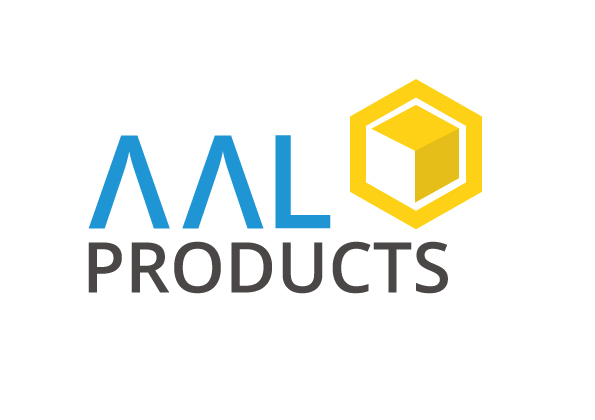 The aim of the gAALaxy project is to test and evaluate the gAALaxy solution bundles and the middleware under real-world conditions. The test will be realized during two pilot phases with a total duration of twelve months.